With passion for music and being an expert in Indie and Alternative (including rock, dance & hip hop variants) music is our main focus, giving us an individualistic edge. You and the music you want is our main focus, We can do pop too if you wish. We feel sound quality is part of the experience of listening to music. So to compliment the music by making sure every week point over our systems are shored up opting for lossless audio WAVs over compressed MP3s (where available), whilst using professional grade audio equipment & sound expertise to push towards the best sound quality we can get out of the setups and PA we use. We push for all elements of Djing, particularly when it comes to the music and style. For us we believe making the effort in lighting and sound makes all the difference, making sure our setups are some of the most stylish is really important, and one part of the over all experience to your event. Required by many venues, Alt. 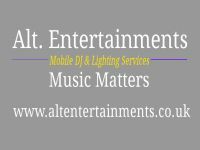 Entertainments has a current PLI policy with National Association of Disc Jockeys in the amount of £10 million. Also required by many venues, Alt. Entertainments has supplied satisfactory evidence of holding current PAT inspections of their equipment dated within the last 12 months. A Method Statement outlining Alt. Entertainments&apos; Health & Safety procedure for setting up disco equipment has been provided. Alt. 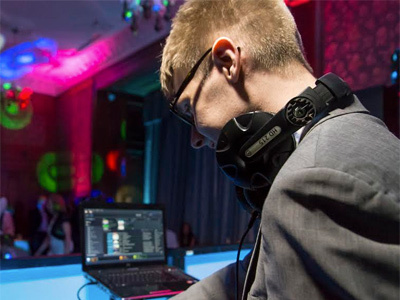 Entertainments has provided Risk Assessments undertaken at events sourced via needadisco.com, indicating that they can undertake these competently. Why do people choose to book Alt. Entertainments? "A fantastic evening totally supported by Ian and an excellent range of music for the (very demanding) party girl and her guests. Thanks." "Thank you so much. It was a lot of fun a great pleasure. " "I don't think Ian (and his Father) enjoy the job very much." "Ian was great, he played the songs I had provided as a playlist and I instructed him not to play novelty music such as The Macarena. I'm not sure if he got requests for this type of thing but a couple of staff members said he was rude when they requested certain songs, saying he was playing to a strict playlist. This was my instruction, however I think perhaps how it was put across could have been better. Other than that, he was great and I would definitely book him again." "Ian was fab! I couldn't have asked for a better Dj his styles of music were fab from the normal disco favourites to heavy metal what's not to love Many Thanks!" "Thank you so much. It was a lot of fun a great pleasure." 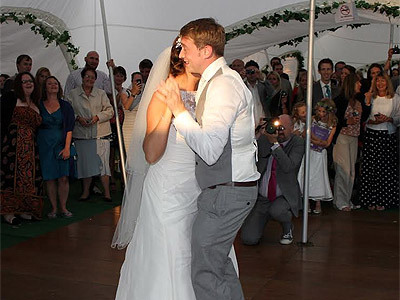 "Ian stepped in at very last minute to play at our wedding. He was thorough, professional, accommodating and read the crowd perfectly!" "Thank You so much for booking with me, It was my pleasure. I hope you enjoy many years of bliss together." "Brilliant service provided fantastic music and lovely guy. Couldn't recommend enough"
"Thank You ever so much! It was a thrill to be let off my lead and show what I can really do for the right crowd." 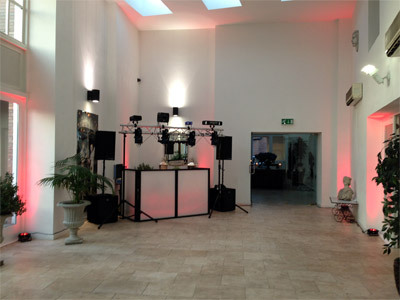 "Very good disco and very accommodating to our needs." Alt. 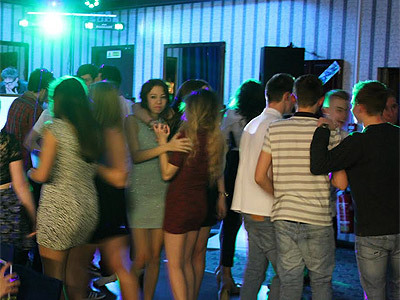 Entertainments also offers a range of additional party services not directly linked to musical entertainment. If you are contacting Alt. Entertainments about an event, it's always a good idea to include the DATE, LOCATION, EVENT TYPE, AGE GROUP and TIMINGS to speed things up!